Geology Erratic boulder on Limestone of Namurian Age exposed in the stream bed. Record Name Lartington. Deepdale. The Great Stone. 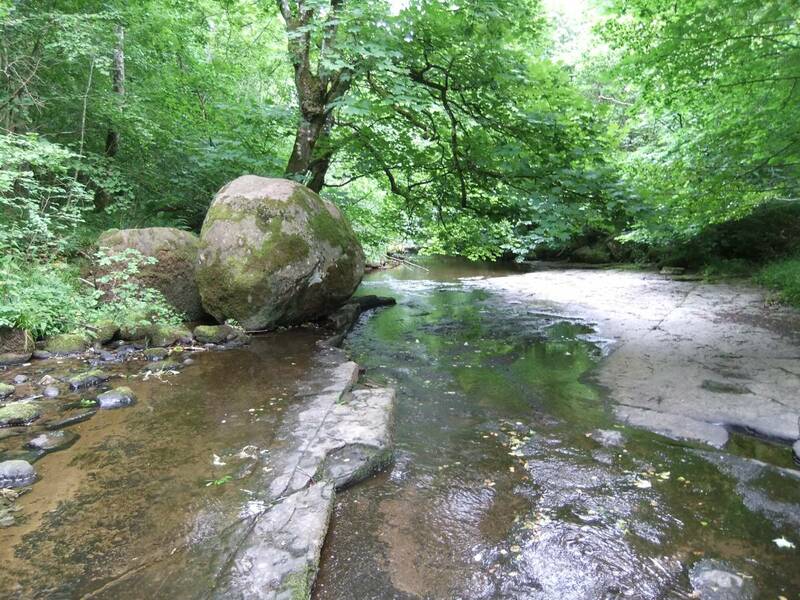 Record Description The Great Stone lies directly on the exposed limestone bed of Deepdale Beck approximately 1km upstream of the confluence with the River Tees. 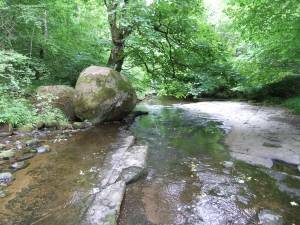 Under low water conditions it is possible to walk up to the boulder along the dry bed of the Beck. Under normal conditions, the best approach is to follow the public footpaths along the south side of the Beck. The Great Stone is best seen from the south bank as it is located below the steep and muddy north bank. This Great Boulder is a rounder boulder of Shap Granite which measures 2.4 at the greatest dimension. 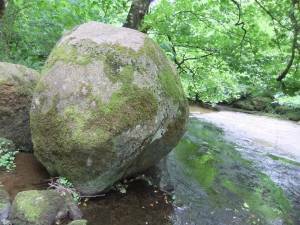 This boulder is the largest of at least 28 Shap erratic boulders of different sizes, several of large dimensions, that I photographed during two recent walks upstream from the confluence of Deepdale Beck with the Tees. 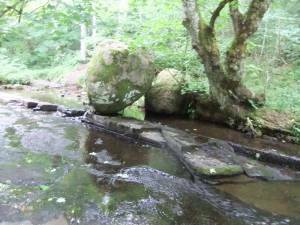 In addition to Shap Granite erratics there are an uncountable number of erratics of different rock types in the bed of Deepdale Beck. Most are of greenstone- Lake District Volcanic erratic, type. A few erratics of The Brockram, a red Permo-Triassic conglomerate rock from the Vale of Eden were present. Additional Notes The Great Stone is shown on Photo Image Nos 1-3 below. Selected examples of other erratic boulders, some of Shap, others of green Lake District Volcanic type will be the subject of a later Record. These records of erratic boulders are made within a current personal programme of fieldwork on the catchments of the River Balder and of Deepdale Beck aimed at recording the locations of individual Shap and other erratic boulders from Stainmore to the Tees. It is then hoped to confirm or revise the existing southern limits of the stream of Shap erratics. The writer considers that the evidence will show that streams of Shap boulders crossed Stainmore through Deepdale and Balderdale north of the Stainmore Summit Gap and some distance to the north of the line of the A66 road. These Ice Streams with the Shap Granites were then diverted due south by the Teesdale Ice to deposit Shap Granites on Barningham Moor and all points east and south.